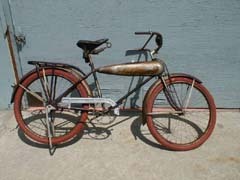 The Schwinn Aerocycle was the first streamline designed bicycle to be introduced by Schwinn, and arguably the first streamline bicycle in the USA. The tank fully enclosed the frame tubing for a clean look. The aircraft theme was carried into the decals. 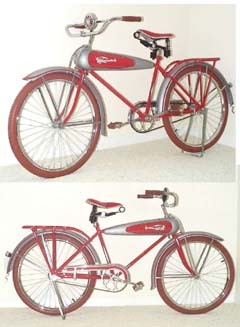 Most Aerocycles were silver with red accents, although they have been found in other colors. The most recent unusual color found was orange and black. Unusual color Schwinn Aerocycles and other Schwinn models for that matter are often found to have come from the Chicago Cycle Supply company.